I need help. I’m currently working on a book about the Donora smog event of 1948, and I want very much to present the most accurate list of the smog victims ever published. Three people are sometimes listed as having perished in smog, but for many reasons finding definitive information on them has proven extremely difficult. I’ve listed below key information I’ve been able to find so far on each person. Might you or someone you know be able to provide any insight into any of them? I haven’t been able to find much of anything on anyone named Faulchak having anything to do with Donora. I believe the spelling of the last name is inaccurate, but even when I try numerous alternatives I come up empty. If anyone knows who this might have been, please do let me know. I have found a variety of Ruth Joneses who lived in or around Donora in the 1940s. For instance, there was a Ruth Jones who was born in February 1921, died January 11, 1949, and is buried in Monongahela Cemetery. That might be the one I’m looking for, but I’ve also found a Ruth F. Jones from West Eagle, PA, who was born possibly March 13, 1902, or possibly sometime in 1905. She died April 25, 1949, and is buried in West Newton Cemetery. If you have information on either of these people, or other Ruth Joneses from the area who might have been a smog victim, please let me know. As you might imagine, there have been many Alice Wards in Pennsylvania, several in Western PA. The only Alice Ward who seems to fit the Donora smog scenario, however, is someone born September 1, 1879, in Wales, with the apparent maiden name of Catherine Dyson. She was married to Thomas Jones, died at Charleroi-Monessen Hospital on March 26, 1949, and is buried in Monongahela Cemetery. If you can provide more information on this Alice Ward or any other who might have been connected to the smog, please let me know. 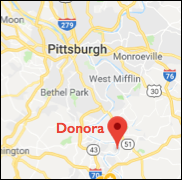 I much appreciate any help anyone can provide to shore up a complete, accurate list of Donora smog victims. Please email me at atmcphee@gmail.com or leave a comment below.